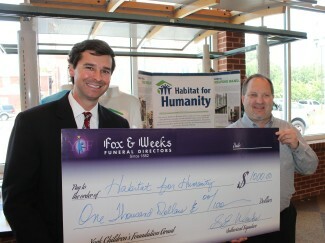 Fox & Weeks Funeral Directors presented a York Children’s Foundation grant in the amount of $1000 to the Coastal Empire Habitat for Humanity Restore in July. Coastal Empire Habitat for Humanity Restore is a nonprofit home improvement stor and donation center on Martin Luther King Boulevard that sells new and gently used furniture, home accessories, building materials and appliances to the public at a fraction of the retail price. All proceeds generated are used by Coastal Empire Habitat for Humanity to build homes within our local community. Fox & Weeks has now awarded nearly $20,000 in York Children’s Foundation grants since 2012. Each time a family purchases a casket at Fox & Weeks, a portion of the cost is donated to the York Children’s Foundation in the name of the deceased and the accumulated funds are distributed quarterly through an application process to area non-profits benefitting children and children’s causes. The York Children’s Foundation is affiliated with the Mathews International Corporation casket division and has delivered millions of dollars in grants throughout the country since its introduction in the early 1990s, and Fox & Weeks is the only funeral home in the area actively participating in the York Children’s Foundation program. The purpose of the York Children’s Foundation is to support non-profit organizations dedicated to children, and any organization in the Coastal Empire with the primary purpose of providing for children’s needs is eligible to apply for a York Children’s Foundation grant. Please call Fox & Weeks at 352-7200 for more information or click York Children’s Foundation to learn more about the York Children’s Foundation application process.